This is one of the first things that we saw as we pulled into KVI last August. One of the kids spotted it immediately. 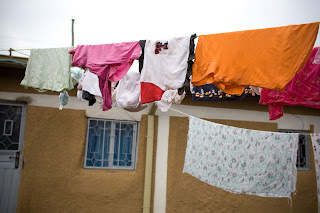 We found out that the orphanage had purchased a large bulk of clothes for the kids at a market in Addis. They "just happened" to have a Texas Tech onesie in a large market in the capital city of Ethiopia. That shirt "just happened" to get to KVI and on my son the very day that Michelle was there photographing kids. I don't for one second believe it "just happened"! I believe in a Providencial, Sovereign Lord that knew the comfort this shirt would bring on hard days, days of reality that life had taken a different turn, days of uncertainty about the future........ He is good my friends. We can't begin to imagine our lives without Abe. He has changed our lives in every way. He makes us better. Abe shows such strength and determination that it makes each of us want to work harder as well. The Lord has so graciously blessed our family by this one little boy. He has shown us so much more of Himself, and for that we are humbled. Posting this again. My blog got some random comments from one guy named Ed--- comment after comment after comment. Hill said, "mom, why doesn't Ed like you??" I'm pretty sure it was spam so I deleted the post until I realized it was posting on every blog post of mine. I switched to comment verification, so hopefully that will do the trick. I just love hearing Kris worship though- so I put him back up! Have a great Memorial Day. I first heard about Clayton recently while watching a sermon by Francis Chan. Watch his story below. I pray that my kids have the same unwavering passion for Christ as Clayton. We are almost officially done with the Alexander Academy this year and we are excited about the summer. I love not having a schedule around here!! I think it is off to a great start though-- Avery just came in carrying a branch with several leaves and said, "mom, what is this?" I was so quick to make her throw it away and shower, that I didn't get a picture........so this one will have to do. 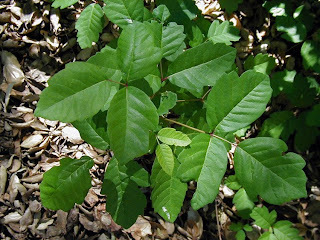 It is poison ivy! When I was her age, my best friend and I had a genius idea to rub poison ivy all over us to see what would happen. I either rubbed harder or am just REALLY allergic. She ended up just fine and I literally was so swollen that I couldn't see for 3 days. It was great fun! Hope Avery reacts more like Hilary and less like her mama! He sat by himself for 2 minutes! We were all cheering him on and he looked at us like, "what is all the fuss about??" He also is getting so much stronger and bearing more weight as he is trying to crawl. He needs to get his hands more open in order to better bear weight, but once again we were brought to tears at the work being done in his brain to allow these new skills. Hill and Wick were cracking him up by throwing balls and knocking over Elmo, Avery was filming, Issy was being silly, Susan was sitting there getting my wee one to work hard, and I was standing in awe, thanking the Lord for His sweet provision of Abe. I am so humbled that I get to parent this child, that my kids get to learn daily from their baby brother and that we get to participate in the Lord's great work in his life. We are blessed! Please take a moment to read the passionate plea of a mother whose child is waiting in Ethiopia. It is such a hard place to be whatever the circumstances--to have a child that is yours legally, or that is every bit yours in your heart, and yet you can't go. This is such an unusual circumstance and we are asking that you would join us to pray for this family so they can bring their daughter home. Also pray for several other families that have had referrals for a REALLY long time (this family, another and another) and have still not passed court. Pray the necessary documents needed to have a successful court date will be completed and they too will be able to travel soon. Ultimately pray that He would be glorified through the process, that more will come to know Him and be drawn to His heart for adoption. We have a daughter in Africa, an AIDS orphan . . . placed in limbo by our own government. We are Tom and Michele Gautsch, we live in Tennessee. Tom is an Orthopedic Surgeon and Michele is a full time mom. 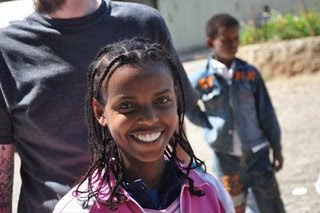 We have a total of eight children now that we have adopted Marta (12 yrs old) in Ethiopia. 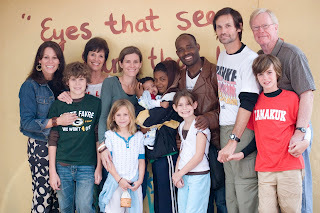 Three of our children are biological and now five are adopted, three from the U.S. and two from Ethiopia. We are very, very anxious to unite our family. We had the unfortunate timing of our court date being scheduled just behind the new TB screening regulations and we have been stopped in our effort to go and bring home our daughter, Marta, from Ethiopia. We passed court successfully March 31, 2009, after just short of a year of work in the extensive adoption process. According to the Ethiopian government, Marta is our daughter in all ways, most certainly, legally. We know she is our daughter not only legally, but spiritually, morally, ethically - in all ways, she is our daughter. However, on March 23, 2009, the U.S. CDC began phasing in new TB SCREENING requirements, and it is the rigid interpretation of this protocol which is preventing us from bringing our daughter home, for at least two more months and possibly many more. Marta is a post tb patient, however her tb left a scar on her lungs, and thus on her chest xray. It will never be normal. The rigid application of this screening protocol doesn't allow the panel physician to clear Marta to travel, even though she has a known tb status: post treatment. This protocol was for screening unknown tb status. Our Marta's status is documented: adequate treatment, successfully completed. The screening that Marta is being delayed for has never been proven to effectively reduce the rates of tuberculosis in the immigrant population. In fact, the vast majority of first world countries don't do this screening at all, and the ones that do, screen the immigrants after they arrive in the country. If we were British, or French, or Norwegian, Marta would be home with us, right now. The CDC has arbitrarily decided to implement this policy in only twenty countries. There are seven countries with a higher endemic incidence of TB than Ethiopia, where the CDC does not require screening with TB cultures. If Marta was from China or India, both countries with ten times more TB prevalence than the U.S., she'd be home right now. Our family was supposed to travel Saturday, April 25th to Addis Ababa to meet our daughter again and bring her home. We had an Embassy appointment for our visa scheduled on April 29th. 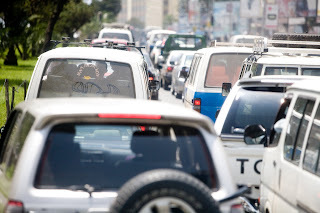 On Friday afternoon, April 24th, the day before we were to travel, we were called by our agency and told not to come. This news, to say the least, was devastating. We had spent the past many weeks organizing and preparing for our trip. We had to make arrangements for the younger children to have a good caregiver in our home, plus of course prepare them for our time away. We had been gathering and organizing and packing our donations and humanitarian aid for many weeks. Thomas, the dad, had to make extensive arrangements to be away from his solo surgical practice, schedule patients for surgery around his planned trip in order to maximize their care as well. By Friday we were packed and ready to go, the excitement at the house was at a peak for all...until that call came. Then it all came crashing down. In disbelief, Tom started manning the phones, trying to find a way, any way to talk to someone about this. Michele was simply devastated, crying, trying to console the kids while her heart was breaking. Tom spent until almost four a.m. researching the protocols, the actual risks of a post TB patient and learning the data on TB in immigrants in the US and around the world. He spoke with contacts at the CDC, as far away as Kenya, and everyone said, "This is silly, she should be able to travel, she's post treatment." So, until sometime after 4 a.m., the morning of the 25th, (we had to leave by 5:30 a.m.), we hoped to still make our flights and go meet our girl. However, we hit a wall of bureaucracy and were told, again, in the early hours of that morning, "don't come." And so we did not go. Full stop. We have been wracked with worry over our daughter and depression over the situation. This manifests physically, in all the normal ways. It is hard to not be depressed, it is hard to kick back into the regular cheerful routines of a busy family life. On a practical, material level, this has also had a tremendous cost. For Tom, he lost a week of work. When you schedule 10 days out of a solo surgical practice, it is not a simple matter to just fill your work schedule back up on the spur of the moment. You lose the days and the income that would have been generated. In fact, you continue to pay the normal operating expenses, but are not, literally, operating. This would have been a planned financial cost. But now, having to plan for an entire new trip, we will have to incur it twice. That is a very significant, large, financial burden. Of course our plane tickets, six of them, had to be returned, with penalties for cancellation and changes. Many other summer plans have had to be reworked and still have not been able to be figured out; this delay affects our children and extended families and their plans - put on hold - as well. Our bags of humanitarian aid remain stacked in our foyer. Our suitcases with personal clothes have been unpacked, but our smallest children still ask when we are going, confused. For Marta's health, she needs to come home and have adequate nutrition, safe surroundings and the love of a family to help her heal from the many traumas she has experienced in her life. Staying in an orphanage, half a world away from her parents and family, does nothing to help heal the heart and body of this child, our daughter. Even several months away from her family makes a difference to a child, especially one this age and with her life experiences. The hardest part, perhaps, for our hearts as parents, is Marta's experience. Marta is not a toddler or infant. She is an older child. She is twelve. So she has awareness of what is going on, but is not yet old enough to fully understand the details. Any older orphan, in particular, is going to really wonder if it could possibly be true: "do they really have a family? For real? Is it really going to happen?" Because to an orphan, one who has already lost both her parents and everything she ever had, ANYTHING can happen and NOTHING is forever or for sure. And this is what our Marta now has experienced: she wondered if we were really coming...they said we were. But - we didn't show. And that was explained to her, they said, and they tried to make her understand the delays and that we would come as soon as we could. However, even if her head can hear and understand a bit of the explanation, what is imprinted on her psyche and her heart is the confirmation of her deepest fear: we didn't show. Period. And that will have a long term cost to this young girl, and our family, that you can't measure in computer data. The CDC cannot measure the scar that is left by this. They can quantify the scar left on her lungs by the TB. But they cannot, nor do they care to, measure the scar left by this unwarranted delay. We can, we will live with it and try to help her over it. But this didn't have to happen. This can be changed with a simple decision to see Marta as an individual, as a patient if you like, but best, as a child. Marta is not a random immigrant who will vanish into the unknown masses in our country. She will not drain the country's resources, nor will she be a risk to the health of the greater population. She is our child. She is coming into a family where her dad is a doctor. We had to prove we were willing and able to care of her, to the fullest extent, in every way and document this with Homeland Security, even before we were allowed to proceed with the long adoption process. We think you would be hard pressed to have a more documented or well tracked person come into the U.S. than an adopted child. Marta is a child of U.S. citizens, her life and family is here. She is our daughter, and she needs to come home. And here's to the rest of you great moms out there! You guys rock! 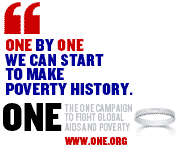 15 million children, orphaned by AIDS worldwide. That number is equivalent to the populations of New York, Paris, and Bangkok, combined. Can you wrap your brain around that??? Please, please take the time to go read this great post here. We are headed back. Paper pregnant. Waiting again!! We feel so blessed that the Lord has called us back to Ethiopia to add to our family. We have finished all of our Gladney paperwork, done the dossier and just sent our home study off to CIS. We are praying for our fingerprint appointment and approval to come quickly, but certainly trust in His perfect timing!